Manufactured By – Apple Records, Inc.
First-issue cover with embossed title and stamped number on front lower right corner with no letter prefix but with a gray dot.. "SWBO 101" at lower left of gatefold. "Stereo" at upper right corner of back cover. Pressing has "Mfd. by Capitol...." in white rim text on sides 2 and 4, with various title mistakes and unique number on the front cover. This press has A4 "Obladi Oblada", A6 "Bungalow Bill", B5 "Rocky Racoon", B7 'Why Don't We Do It In the Road' (without question mark) , D1 "Revolution 1", D5 "Revolution 9" and D6 "Good Night". 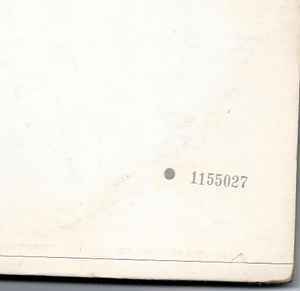 Cover has "The Beatles" embossed, located lower right of center, and sequentially numbered. Issued with lyrics, poster and four large portrait photos. Photos are on heavy cardstock. Capitol, Los Angeles with Sides A, B, C and D runouts bearing Los Angeles asterisk. Comes with fold-out lyric poster and 4 glossy photos on card stock. Hi. The runouts on my record are very different from the ones you posted. Also there is an asterisk on all the A sides and an "O" on the B sides which I haven't been able to find? Besides these differences everything else indicates this is the version I own? Is my version different, the same, or fake?